A grant from the Cambridge Community Foundation is sending 220 CRLS students to take part a conversation with noted playwright/performer Anna Deavere Smith that draws from her new work Notes from the Field: Doing Time on Education at the American Repertory Theater (ART). The work drills down on what has been called the school-to-prison pipeline, a system in which students of color are punished, removed from classrooms and sent into the juvenile justice system in far larger numbers than their white peers. The students will have a chance to take part in a “talkback” with the author, who has earned a national reputation for her works, which create dramatic explorations of topical issues drawing on people’s testimony. A matinee on September 14 will include the performance and post-show. 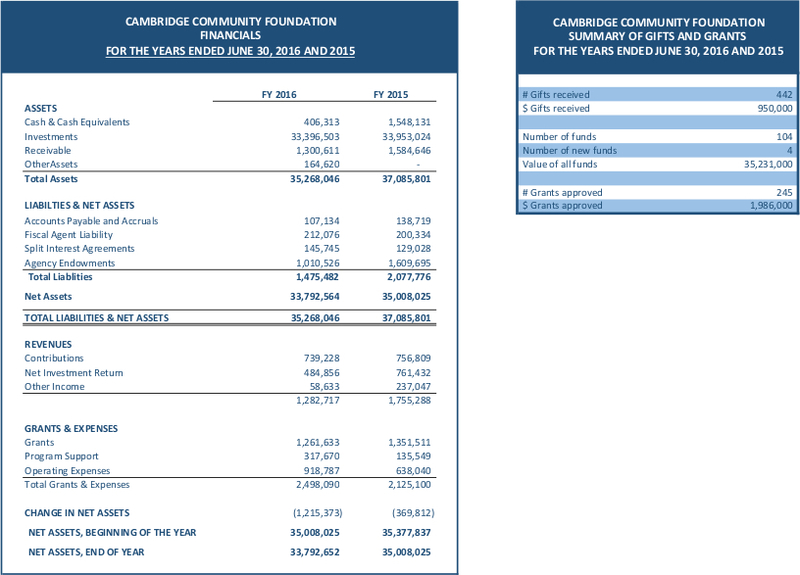 Foundation President Geeta Pradhan is working on a report that will gather together challenges facing the Cambridge community as well as the remarkable resources available here, developed by the City of Cambridge and other agents in a city rich in information and expertise. A key partner in the report is Metropolitan Area Planning Council, a leading regional agency created to promote smart growth, healthy communities and an informed public in the 100-plus cities and towns of Metropolitan Boston. The essential theme of the report is the idea of Shared Prosperity. The small scale of the city and the depth of talent, a tradition of creativity and innovation, and high levels of civic engagement suggest great opportunity to position Cambridge for success. Stay tuned for the report, which will be released at a forum later this fall. A public forum about building pathways into the regional Innovation Economy for local youth and older workers drew a capacity crowd to the Kendall Square Marriott in April. In response, the Cambridge Community Foundation plans a series of conversations to act on ideas surfaced at the forum. The original event was hosted by the Foundation, with partners including Just-A-Start Corporation, Kendall Square Association, Metro North Regional Employment Board, SkillWorks and the City of Cambridge, including The Agenda for Children and the Cambridge Expanded Learning STEAM Network. Sponsors lined up to support the gathering, including Akami, Biogen, Cambridge Center for Adult Education, Cambridge College, Cambridge Nonprofit Coalition, Cambridge Public Schools, the Cambridge Science Festival, Cambridge Innovation Center, Google, Harvard University, JPMorgan Chase & Co., Lesley University, Boston Marriott Cambridge, MassCan, Microsoft, MIT, New England Venture Capital Association, Novartis and The Woodrow Wilson National Fellowship Foundation. The conversations, described as ‘salons,’ will bring together interested people from the different sectors among the partners and sponsors to follow up on ideas about ways to create greater opportunity by better connecting the community to the extraordinary and dynamic economy that is centered in Kendall Square.